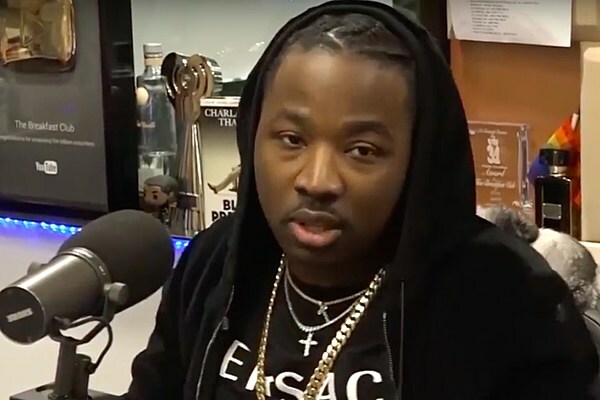 Troy Ave says he's a changed man following his two-month jail stint stemming from his involvement in the infamous Irving Plaza shooting two years ago. That's a point he reiterates several times throughout his new interview on Power 105.1's The Breakfast Club on Monday morning (Feb. 11). During the interview, which lasts more than 45 minutes, Troy speaks on his immediately-controversial new video for his White Christmas 5 track, "2 Legit 2 Quit." In the song and video, he allegedly implies he'd take the stand against the incarcerated Taxstone if he had to. Dope Boy Troy says the way people behaved when he was living life behind bars began to reshape the way he views the merits the street code. "My mentality started changing when I was sitting in jail and then I seen people that was street, how they reacted, how they perform, how they didn't put on in a street way like I would have," he says at one point in the new interview. While Troy says legal stipulations and guidance from his lawyer prevented him from speaking on the specifics his case, he did fer up a general situation to point out the perceived toxicity the not-snitching mentality. He feels it leads people to believe some things are snitching when they're not, and that people have the right to avoid jail time for things they didn't do. "Not talking 'bout my case, but, just, in general, eight outta 10 people will be like, 'I'm not going to jail for somebody else," Troy Ave says toward the beginning his sitdown. Troy goes on to say that the situation is a different one if you and a friend get caught committing a crime, using a pretty graphic theoretical example DJ Envy and shooting someone to defend his co-workers to make his point. If you don't remember, Troy Ave was caught on camera firing a pistol at his alleged attackers on the day the Irving Plaza shooting. Elsewhere in the interview, Troy reveals that he's all set to perform in NYC for the first time since the Irving Plaza shooting next week. He also reveals that he's spoken to members the late Ronald "Banga" McPhereson's family about meeting up with his former friend and body guard's mother. Read all the highlights for yourself below.